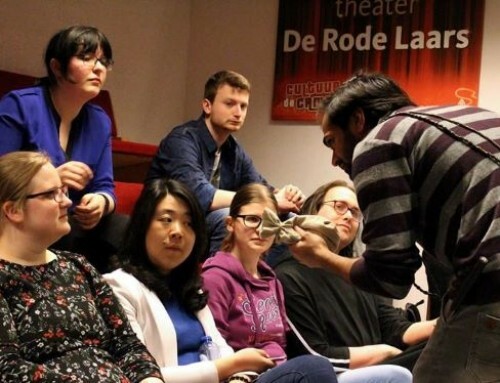 This year, the amateur theater group will perform their original play INBETWEEN in several Dutch cities, celebrating the 400th anniversary of William Shakespeares death. After their tragic death, Romeo and Juliet wake up in Inbetween, together with five other shakespearian sinners. While they await their fate in this world of deception and manipulation, people’s love and trust is put to the test immensely. Old relationships threaten to wither while new relationships bloom in this Shakespearian fairytale. Inbetween, written by Tanya de Kruijff and directed by Ruud Mol, premiered at the amateur theater festival “The Play of Nijmegen”, where it was voted into the finals by a jury of professional theater makers. WOW-EFFECT Theater is a young amateur theatre group with members from 10 different countries. This years projects try to raise funds for the Red Cross Nederland to help asylum seekers.